On Sunday, Deadline Hollywood—the site where last week an editor wondered aloud if there are too many actors of color working—issued a non-apology apology for their article "The Year of Ethnic Castings–About Time or Too Much of Good Thing?" The classic non-apology apology move was buried in a chat between two white men, one of whom says, "I always nodded off at the word 'diversity." 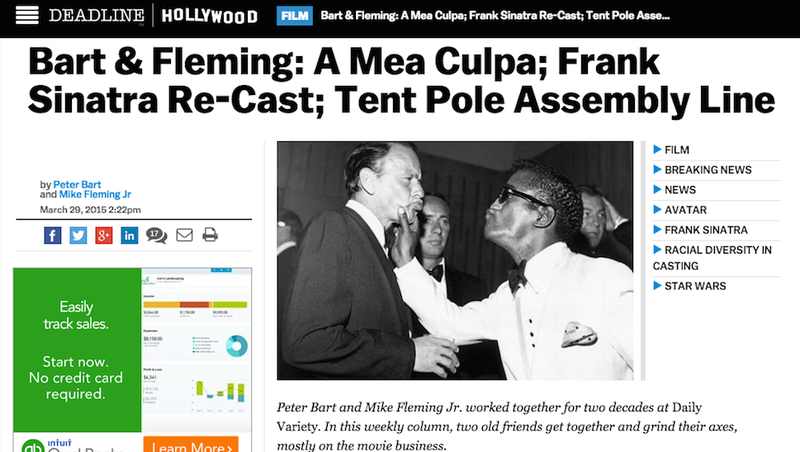 In a conversation with Deadline co-editor-in-chief Mike Fleming Jr. and journalist Peter Bart, the guys talked about diversity, the article and those angry people, getting all vocal in Deadline's comments while Fleming was just trying to take a nap. Let's break this down, beginning with the editor's first entry. FLEMING: I need to start off on a serious note. Deadline ran an article last week that generated controversy and hurt feelings. An unfortunate headline–Pilots 2015: The Year of Ethnic Castings – About Time or Too Much of Good Thing?—created a context from which no article could recover. My co-editor-in-chief Nellie Andreeva's goal was to convey that there was such an uptick of TV pilot casting of people of color that it pinched white actors who've historically gotten most of the jobs, and to question if this could last if it was being treated as a fad. All this was undermined by that headline (which we changed after the fact) and a repetition of the word "ethnic" that came off cold and insensitive." First of all, this is not true. The offense wasn't just the headline, and the article didn't just "question" if all these people of color would last. The article was a clear argument for the terrors that could come to pass if diverse casting continued, using struggling white actors and even the very selectively applied "What about historical accuracy?" question as supporting arguments. It was 12 hours before I awoke to numerous e-mails, some by people of color who are sources, who trust us, who were rightfully incensed. "I know some people who aren't white and they were kinda mad at me, too." I don't believe you can can make an unwise story disappear and pretend it didn't happen. I observed how Amy Pascal raced around with knee-jerk apologies to anyone who'd listen, after those stolen Sony e-mails surfaced. Her actions felt like panicked damage control to me; we decided to face the consequences and take our lumps. Translation: I'm still not going to apologize for what my co-editor-in-chief Nellie wrote because I don't see the problem with lamenting that white people aren't first to get the call for jobs. Stan, why are you so mad? Next, he tried to parse the use of the word "ethnic" to describe people of color, which to me is much less upsetting than Deadline's inability to recognize what all of these "numerous emails" and "hostile comments" were saying. If any of those angry commenters were like me, they were upset that Nellie's post was clearly pinning for "their America" (white America) vis-a-vis Hollywood casting, rather than just objectively relaying information, which is what Fleming tries to suggest. "I have always nodded off at the word 'diversity' – it somehow sounds blandly corporate. The dictionary defines it as "composed of distinct forms and qualities" and I find hope in the notion of distinctive. People who are distinctive deserve the opportunities, irrespective of their color." LOL at "irrespective of their color." Must be nice. Then, Bart says he hopes all this diversity spreads behind the scenes, because that's the only way he sees this trend of diverse actors being hired continuing. As I pointed out last week, Bart is right: When an actress like Taraji P. Henson works, she'll spread the wealth by hiring black hair and makeup as well as wardrobe staff. Two points for Bart. I wanted to say a few things to our core readers who felt betrayed. That original headline does not reflect the collective sensibility here at Deadline. The only appropriate way to view racial diversity in casting is to see it as a wonderful thing, and to hope that Hollywood continues to make room for people of color. The missteps were dealt with internally; we will do our best to make sure that kind of insensitivity doesn't surface again here. As co-editors in chief, Nellie and I apologize deeply and sincerely to those who've been hurt by this. There is no excuse. It is important to us that Deadline readers know we understand why you felt betrayed, and that our hearts are heavy with regret. We will move forward determined to do better. That's like punching me in the face and saying "Sorry your face hurts, those bruises do not reflect actions I'd take" rather than simply saying "Sorry for hitting you in the nose." Nellie's piece was not about the problem, it was the problem; it wasn't "questioning if [diversity in casting] could last if it was being treated as a fad," it was treating diversity like a fad itself. Deadline can't apologize if the editors don't know or won't admit what they were doing. (See a now-deleted tweet clearly relishing the controversy.) And if they don't acknowledge the problem, how can they apologize for it—let alone go about fixing it?